I'm carrying on with adding more spring touches around the house. 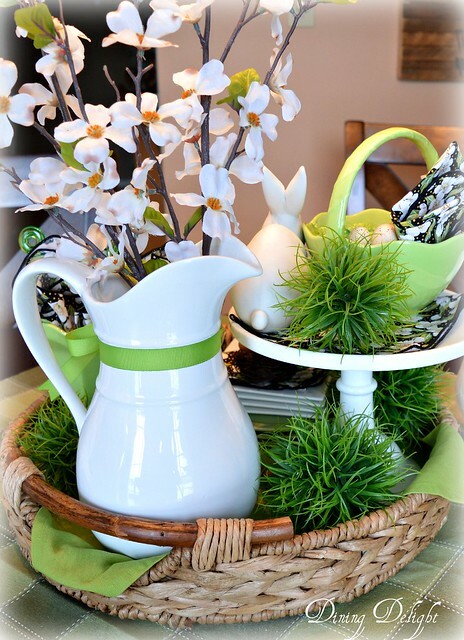 Gathering together some green & white décor items and placing them in a round woven tray, I was able to create a spring vignette for the dining room table. This bright apple-green colour is very spring-y and goes well with the white items on the tray. I also included these contrasting black napkins with a floral blossom pattern which complement the faux dogwood blossoms in the white pitcher. 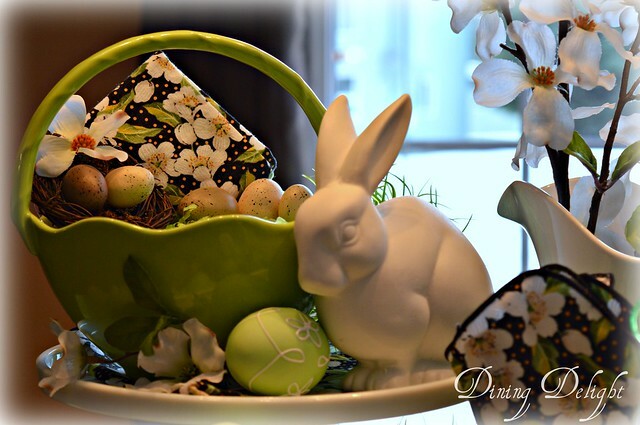 On top of a white pedestal cake plate, I placed a green Easter basket-dish and a white bunny. An egg cup was set on top of a stack of small plates with a natural looking nest sitting alongside. How about an ice cream sundae to welcome spring? These sundae cups are just the right shade of green for my display. The life saver looking sticks are long handled spoons to reach way down to get all of your treat. These white bunnies are from Home Outfitters this year. I think this little guy is so cute! Below, you can see the faux air plant orbs (purchased at a local gift shop years ago) I placed around the tray to add a bit of spring time grass to the spaces in the tray. Though there is still some snow outside, it's definitely starting to look like spring inside. 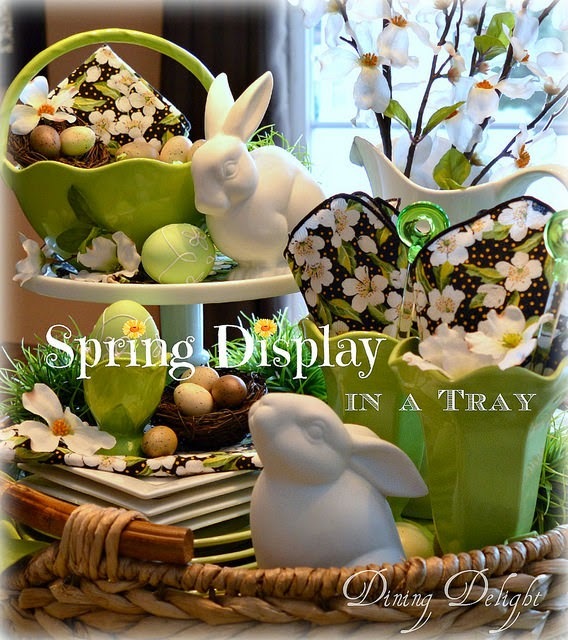 The beauty of decorating on a tray is that this display can be moved to another area with relative ease. 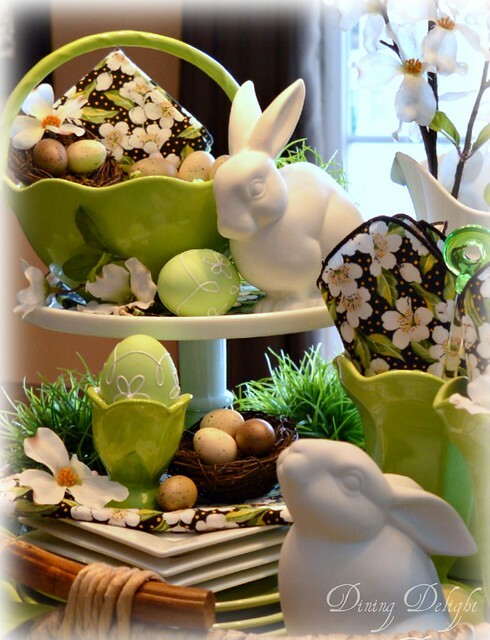 That's a good thing since I'll need this table cleared soon to start working on my Easter tablescape. 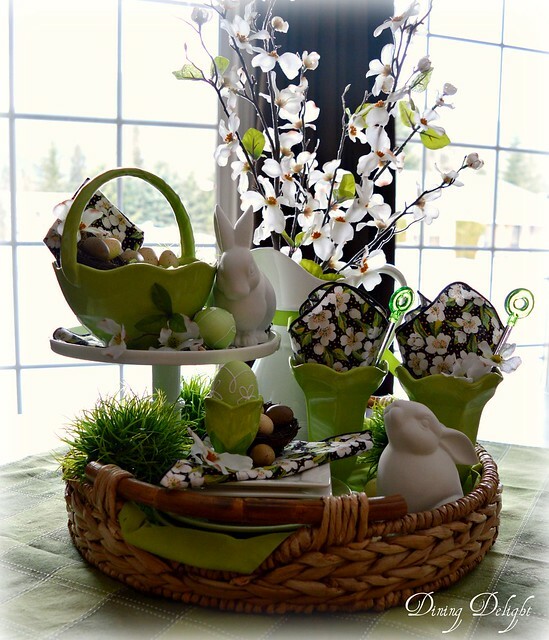 Have you started putting out any spring décor? Go ahead and get out that box of décor items. All it takes is one bunny and you'll be in the mood! Gorgeous I love the flowers so pretty. Yes, I am pulling out my spring stuff too! Love those dogwood napkins. 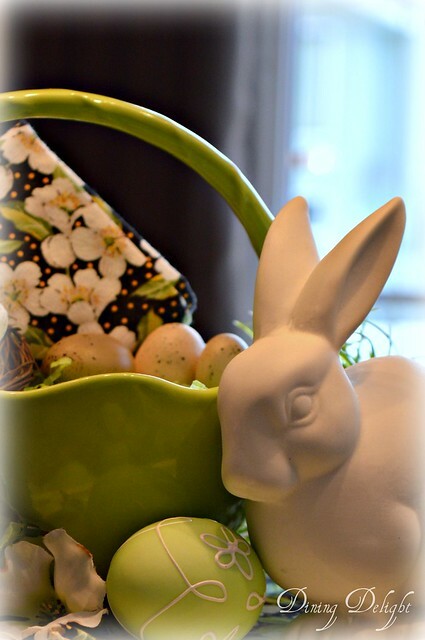 I'll be showing a green and white tablescape on Tuesday, and I have more spring rabbits to show as it gets closer to Easter. Thanks for a lovely eye candy post! I love this! It's so full of life and spring. I've yet to begin to decorate for spring but you do inspire me. This took my breath away! You have a knack for grouping items for a themed display, and I would love to do something for my dining room as soon as I put away the Key West decor. 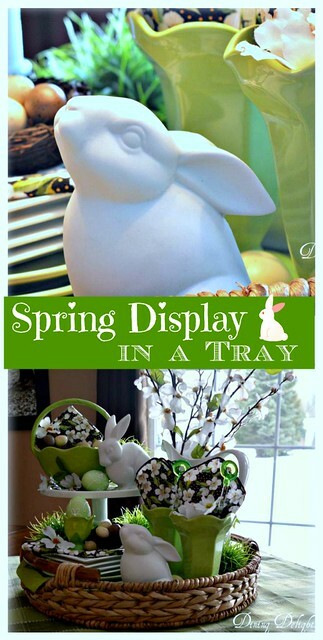 Love your spring vignette....I was looking for ideas for my table and you had so many to share! 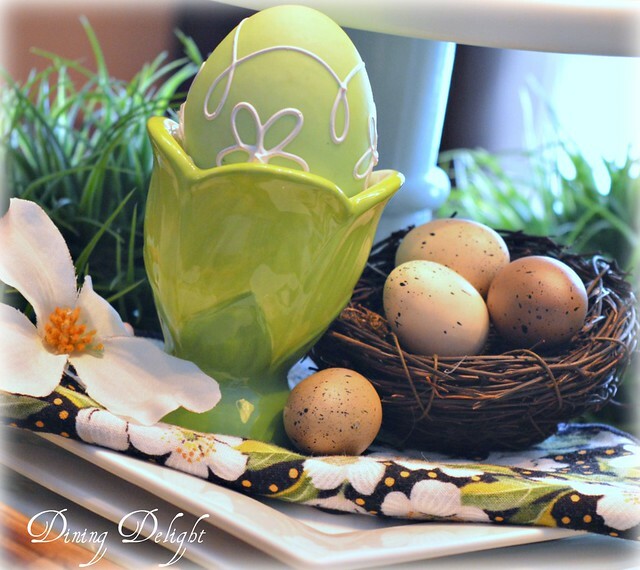 Always love your blog posts and seeing your decorations & tablescapes. Beautifully done! I love the spring green with the crisp white. Your mix of items is totally charming. 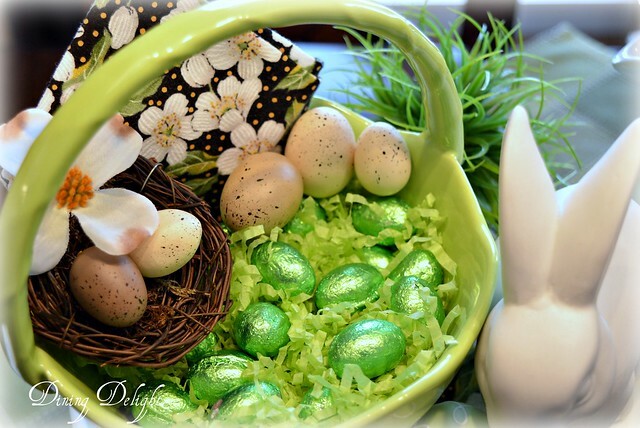 This is such a cute cute Easter display on a tray! Beautiful Spring display! 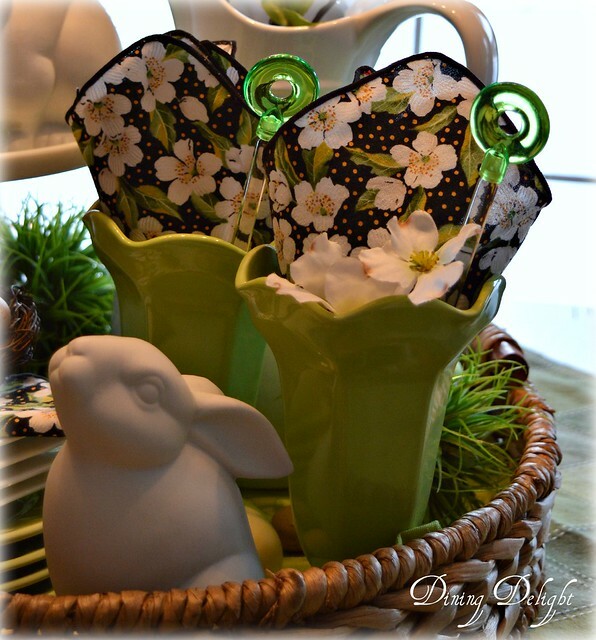 I am just starting to decorate for Spring. 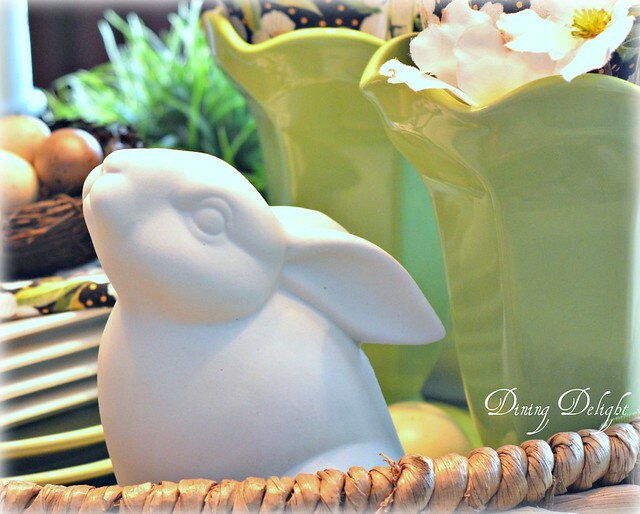 This is just precious...from the bright colors to the bunnies to the egg cups! I love trays, too. I probably have more than I need! lol! I have been sitting here for 10 minutes, breaking down each aspect of this gorgeous design, mentally checking my equivalent of what you have used! I am so inspired because I have been wondering what I wanted to do on my table! And you have just given me the idea -- thanks so much! You created such a sweet AND beautiful vignette. I must comment on you photo taking skills as well. Even with bright background lightening, you managed to take clear, well-framed pictures. I'm jealous of your abilities. Your display is so pretty!! 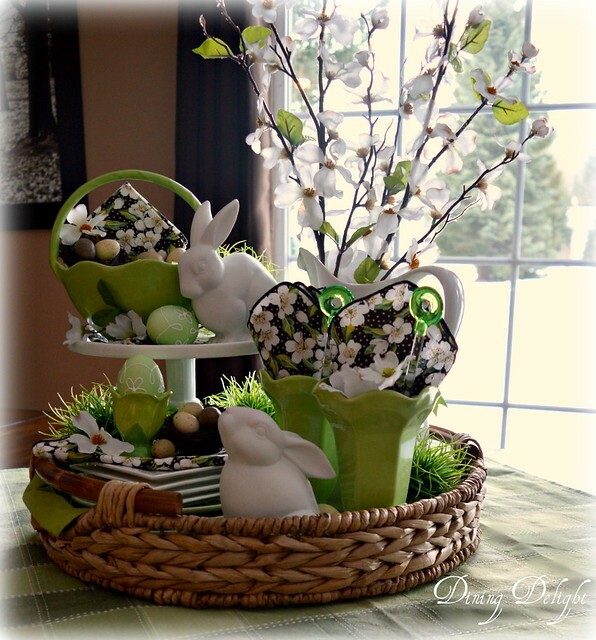 I love the bunny & all the green! Would love it if you shared it at our link party in my blog please :) Have a great rest of the week! Gorgeous spring green. With the white, it all just pops! Loving the smooth white rabbit. I think the whole setting is really lovely! Love LOVE LOVE!!! Great use of the bunnies. I love green as a main color and I how you coordinated everything based on the napkin pattern. I also did a kitchen table vignette and used a slew of colors based on a set of plates. Thanks for sharing. I'm stoping by from the weekend retreat link party. 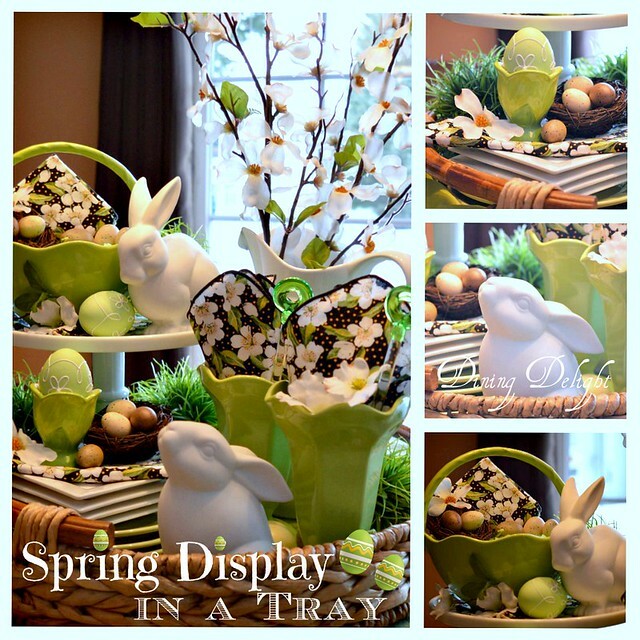 Lori, I just love this display in the tray that you did. Those napkins are gorgeous! Another great tablescape! Have a wonderful weekend! What a cute display! I'll be sharing it at The Scoop this Monday night. Thank you for linking up! So pretty. 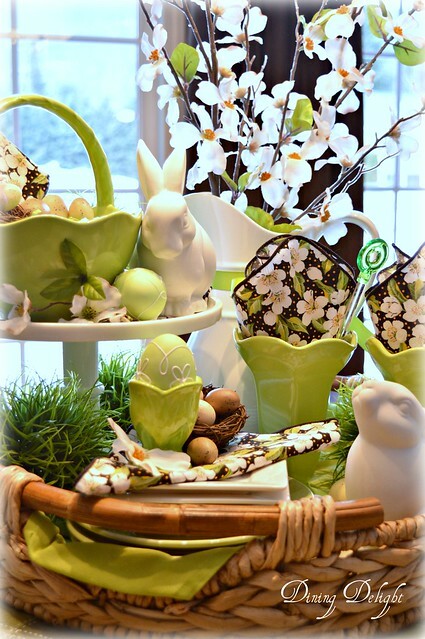 I love the green apple shade with the white bunnies. Visiting from Amaze Me Monday. Have a great week. This is beautiful!! I love the combo of black and white and green!!! I adore those napkins and am wondering where you found them? Beautiful!!! DD, your display in a tray is delightful! Love everything about it! Hard to think Easterbwhen it is so cold! I need to be motivated! I just love this vignette! You make it look so easy! That shade of green is just gorgeous - Thanks so much for sharing at Talented Tuesdays! Beautifully done! I love vignettes like this and trays are the best for creating them with! The coordinated green coloring looks fabulous! This is adorable Lori! I love how you coordinated the green tones in the vignette...Beautifully done! This is really, really gorgeous! Wonderfully done! I love your fresh color palette! SO pretty! This is just what I needed to see today--some inspiration to getting things ready for spring! This is so very pretty, Lori! I kind of think almost everything looks better grouped together in a basket or on a tray. I really like how you've created different heights and pulled in a variety of different things that work so well together. Great color combo! This is soooo pretty!! 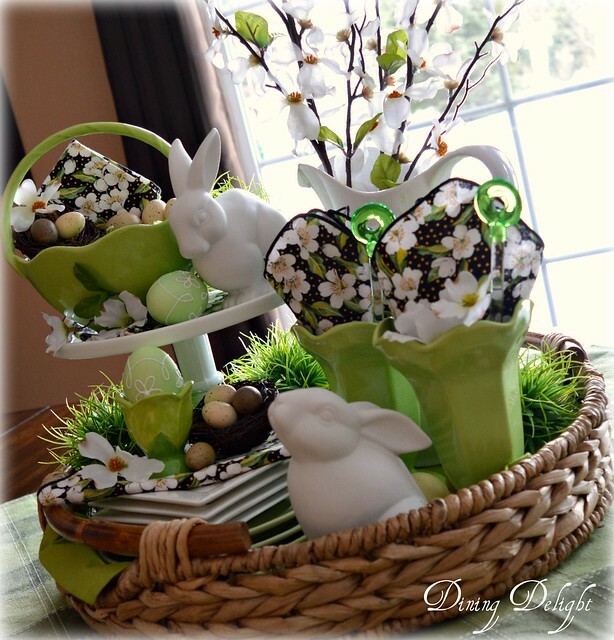 Love the bunnies and all the touches of green!